We all hang our stockings up on Christmas Eve hoping Father Christmas will fill them with something nice. Cats will love to receive this cute catnip stuffed Yeowww! Christmas stocking on Christmas morning! A real treat to wake up to! These Yeowww! 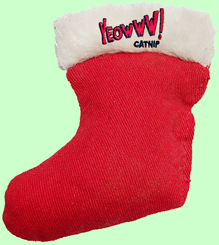 Stockings contain 100% organically grown catnip and no stuffing! They measure approximately 8 cm in height and 6 cm across..